The Gas Company Inc. produced this stationery package for the rebranding launch of this New York, NY interior design firm. The package consists of letterhead, No 10 envelope, business cards, mailing labels, note cards, and compliments cards. Processes include intaglio engraving, PMS grey litho, duplexing, and die cutting. The entire package was printed using Monadnock Astrolite Vellum with the exception of the mailing labels which were printed on Mohawk Superfine pressure sensitive stock. These photographs show the finished stationery package and feature a video of the intaglio run, details of the intaglio engraving dies and photomicrographs of the grey engraving inks. 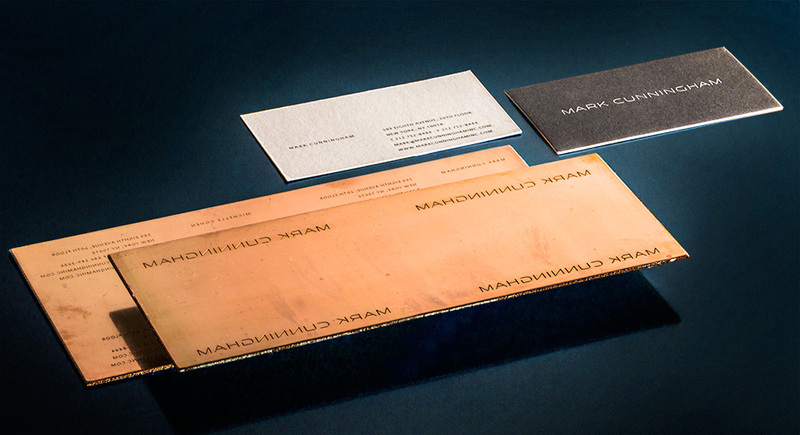 Mark Cunningham Stationery from Doug Laxdal on Vimeo.